FILE - Russian President Vladimir Putin speaks on the phone at the Kremlin, in Moscow, Russia, Nov. 15, 2017. Russian President Vladimir Putin and his Ukrainian counterpart, Petro Poroshenko, discussed implementing a 2015 peace agreement that has failed to end the violence in eastern Ukraine, according to Russian media. "Putin expressed concern about the escalating tensions in Donbas (Donetsk and Luhansk regions in eastern Ukraine) and the civilian casualties increased as a result of the intensified Ukrainian army attacks in the region," the Kremlin reportedly said. A cease-fire agreement was reached in Minsk in February 2015 but violence continues unabated in the region, where government and separatist forces violate the cease-fire almost daily. The two leaders spoke by telephone Thursday, their second such conversation in the past two weeks, Russia's Interfax news agency reported. The news agency said Poroshenko called Putin on June 9 to discuss humanitarian matters, including an exchange of prisoners. Their latest phone call came one day after the Council of Europe demanded that Russia release Ukrainian filmmaker Oleh Sentsov, who is in the midst of a more than month-long hunger strike while he serving a 20-year sentence in a Siberian prison. FILE - Ukrainian filmmaker Oleh Sentsov gestures as the verdict is delivered at his trial in Rostov-on-Don, Russia, Aug. 25, 2015. 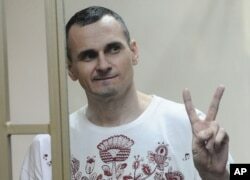 Sentsov, a vocal opponent of Russia's 2014 annexation of Ukraine’s Crimea, began the hunger strike to pressure Russian authorities to release all Ukrainian political prisoners. Sentsov was sentenced in 2015 for conspiracy to commit terrorist acts, a charge he and his supporters contends was politically motivated. Thorbjorn Jagland, secretary-general of the council, which advocates for human rights, democracy and European law, called Wednesday for Sentsov's release for humanitarian reasons, according to Russia's Interfax news agency. "If it is necessary to file a request to pardon him, I will do it with pleasure in accordance with the European Convention on Human Rights," Jagland said. Russian human rights advocate Anatoliy Sak told Russia's RIA-Novosti news agency he visited Sentsov recently and said he looked well and was alert, although his account could not be immediately confirmed. Sak also said Sentsov was being fed intravenously. Western countries, including the U.S., have also been calling for Sentsov's release. Ambassadors representing the Group of Seven nations said Thursday they were "deeply concerned" about Sentsov's "situation."